SUPERSTAR Fremantle captain Nat Fyfe's Brownlow hopes are in tatters after his one-match ban for striking Collingwood's Levi Greenwood was upheld at the Tribunal on Tuesday. 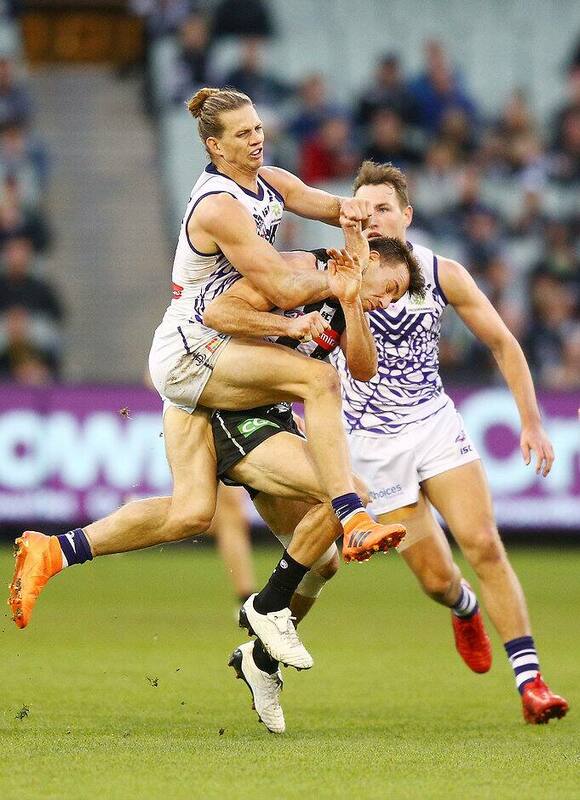 Fyfe sought to challenge the ban on the grounds his conduct was careless rather than intentional, while conceding it was low impact and high contact. The 2015 Brownlow medallist will be unavailable to face Adelaide at Optus Stadium on Sunday. RACE FOR CHARLIE Who are the top contenders now? Nick Tweedie QC, who represented Fyfe, showed four video examples of careless conduct during the hour-long hearing at Etihad Stadium. When called to give evidence, Fyfe said he believed he was a 50/50 chance of winning the football but didn't expect Greenwood to punch it away, and when that happened, he raised his arms to protect himself. AFL legal counsel Jeff Gleeson QC contended Fyfe's jump was unnecessary, and that the Dockers skipper could instead have tucked his arm in. Fyfe said the reaction to raise his arms was instinctive. Fyfe spoke briefly to reporters in Perth after the hearing finished, but declined to take any questions. "Unfortunately, the Tribunal decision was that the week stands," he said. "I'm disappointed by the result but I'm grateful for a fair hearing. Thank you to my counsel, Mr. Nick Tweedie, over in Melbourne. "I'm disappointed I can't be helping my team this weekend against Adelaide but will be doing everything I can in my power to get ready to go against Carlton next week." He sits on 17 votes in AFL.com.au's Brownlow predictor, three ahead of Carlton onballer Patrick Cripps. Fyfe didn't risk a longer ban if he was unsuccessful and will miss Sunday's clash against Adelaide at Optus Stadium as a result.